George Bush, a former businessman turned politician, is seeking a second term as president of the United States. First elected with a largely domestic agenda, he entered his second campaign having directed wars against terrorists and the regimes of Afghanistan and Iraq. He was born a child of privilege, the grandson of a U.S. senator, the son of a man who would be president. There was little to distinguish young George W. Bush in his early years. Despite what he admits was a lackluster academic record, he earned degrees from two of the nation's top universities, Harvard and Yale, where he played on the baseball team. Though he was born and educated in the northeast, his heart was in the state of Texas. He was a pilot in the Texas Air National Guard during the Vietnam War, serving in a unit that never saw foreign combat. When his education and military service were complete he went into the oil business, and eventually became an owner of the Texas Rangers baseball team. In time, though, the love of politics in his blood came through. 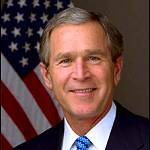 Two years after his father was defeated in his run for a second term as president, George W. Bush was elected Texas governor. Almost from the start there were rumblings that he might follow in his father's footsteps to the White House. It did not take long. In 2000, he accepted his party's nomination for president. 'We vow to our nation we will seize this moment of American promise. We will use these good times for great goals,' he said. The campaign was full of controversy from the start, from the aftermath of the Clinton impeachment drama, to the revelations that George W. Bush once had a problem with alcohol. 'Somebody discovered I stopped drinking. And somebody said why did you quit drinking? I said because I was drinking too much,' he said. He said there were two factors in his decision to change his lifestyle - - his restored faith in God, and his wife Laura, a former school teacher and librarian who at the time they married had no interest in politics. He ran on two themes -- as 'a compassionate conservative' and 'a reformer with results.' The election was close and in the end the Supreme Court cleared the way for his inauguration on January 20th, 2001. Though facing a divided electorate, he pushed ahead as if he had a clear mandate, focusing on his domestic agenda. He was pushing school reform on a visit to Florida, sitting in a school room with a group of children on the morning that changed the nation and his presidency. Within seconds, George W. Bush became a war president. 'Today, our fellow citizens, our way of life, our very freedom came under attack in a series of deliberate and deadly terrorist acts,' he said. Many things changed for the president on September 11, 2001 when terrorists struck in New York and Washington. Aides say his manner became far more serious, his determination and belief in himself and his cause unshakeable. John Fortier, a political scientist at the American Enterprise Institute, says the world saw a new George W. Bush as the war on terrorism evolved in Afghanistan and Iraq. But Stephen Hess of the Brookings Institution says that while some things changed others facets of the president's persona stayed the same. He points to a distinctive management style honed in business school and the Texas Governor's mansion. 'It was a style strongly based on giving precise assignments, holding people responsible, delegating responsibility, having a rather clear objective, some would say vision, of what he wants to do,' he said. Though he ran on largely a domestic agenda in 2000, this year President Bush is keeping his war record front and center. He says he has proven he can keep America safe. His objective in this election is to convince the voters they can put their trust in him for four more years.